Library Advocate. : Can You Spot the Library? It took about a year to remember and find time to post about Cindy Medivilla's 12/07 post about an item in Deputy Dog entitled, "Can You Spot the Library?" 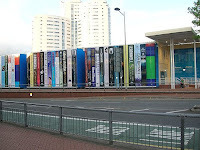 A library in Cardiff, Wales, painted the front wall of a temporary library building as a giant, colorful bookshelf. What a fun idea. Here is a Flickr photo by Ben Bore of the "bookshelf" wall. Painting a bookshelf wall mural would be a great fundraiser/art project for school and public libraries. How to find a California Association of Muralists? When I did a quick Google search, look what popped up on the California Council for the Humanities site. CCH loves to promote California stories. Why not promote California classics in the form of book shelf murals?